a) real Coke (we only have diet pop in the house, my dad’s diabetic) makes me extremely dehydrated. like, worse than alcohol. b) keeping Cheetos in one’s room leads to…you got it, EATING Cheetos. According to a friend of mine, “bawls is yum” but is to be used only in dire emergencies when one needs the ability to stay up all night. Personally, I think that a little sleep is better than none – helps the mind process all that info you’re trying to cram into it. Anyway, for the next 4 days I will cram like I have never crammed before. Seriously, I’ve never crammed like this before, ever. I’m going to force myself to go to the dreaded Robarts Library to make myself study tomorrow night after work, as I do get more work done at a library. (What’s kinda creepy is that I could stay in Robarts ALL NIGHT if I wanted to. They’re open 24-hours to students.) And on the weekend, I’m going to get to the public library near me early so I can get a study booth. Plus it gets me away from the Cheetos. I’m almost done the second sleeve of the Must Have (I worked on it yesterday in lecture, at SnB, and today while watching ER. Hey, a girl needs a break after a 25% midterm!). I’ve also started a scarf for my cousin which is WICKED. I’m starting to cop out. I think I might give yarn as presents. 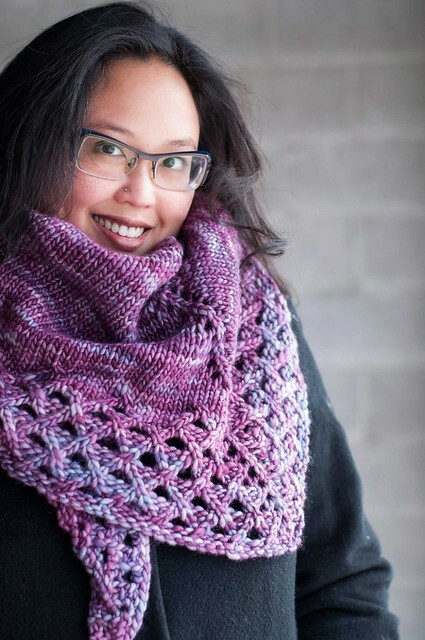 And now that I’ve discovered this scarf, I may have to make them for all that remain on my list! It’ll probably be quiet around here the next couple days.